During the summer solstice, the sun is said to be at its strongest. The sun and the dragon, which is the benevolent keeper of the river, both contribute to the farming season. 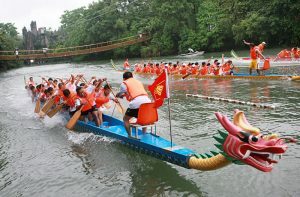 In recognition of this momentous occasion, China began holding dragon boat races roughly 2,500 years ago. The idea to interact with the river in a playful was meant to revere the dragon spirits that watched over the rivers. Failure to appease those spirits meant that a drought might occur, or heavy rains would cause flooding and ruin the harvest. Dragons controlled the winds and rains, the could cause monsoons or bless the people with enough water to grow. This is a stark contrast to the Western or European concept of a dragon, which is typically malicious in intent. Asian dragons are not considered to be creatures worthy of slaying, because they benefit the people as a whole. In fact, Chinese people often refer to themselves as dragons because they draw from this mythical strength. Those feelings come to a head in the dragon boat, which is sometimes bless by a Taoist priest. The priest will dot the eyes of the dragon, symbolizing its awakening for use in the race. The boating tradition likely came from Polynesian va’a, which are canoes used for long-distance voyages. It began roughly around the same time that the Greeks were creating their games at the Olympia, and it’s a tradition that continues to this day. In fact, it’s one of the best times to visit China as a foreigner.